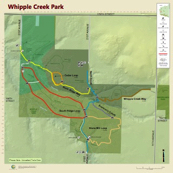 Mission As a citizens advocacy group, the Whipple Creek Park Restoration Committee, in 2012, along with Clark County Parks, officially adopted Whipple Creek Regional Park, although volunteer maintenance hours, small grants, and materials have been contributed since 2010. Goals Priority One is to fix the existing trails. 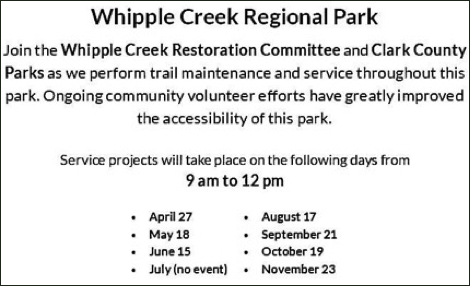 Priority Two is to repair and restore the historical features contained within the 375+ acre park. Priority Three is to create the Park as a neighborhood destination and a multi-state attraction, providing recreation, education and economic impact as part of The Intertwine System of parks and with assistance from Historical and Preservation Associations. Values Health, recreation, education, historic preservation, and environmental preservation of parks for future generations. 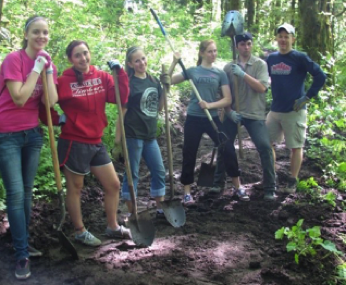 Volunteers have dedicated thousands of hours and have been recognized by Clark County Parks as the highest quantity of volunteer hours and having made the most improvements. John Deere North America and our friends at Pape Machinery. You, too, could be this happy [or irreverent] if you join one of the work parties - do it now! You, too, could win the most colorful T-shirt contest if you join a work party.